Barcelona, December 18th, 2017- Luminor DCB has received approval for commercialization in New Zealand. 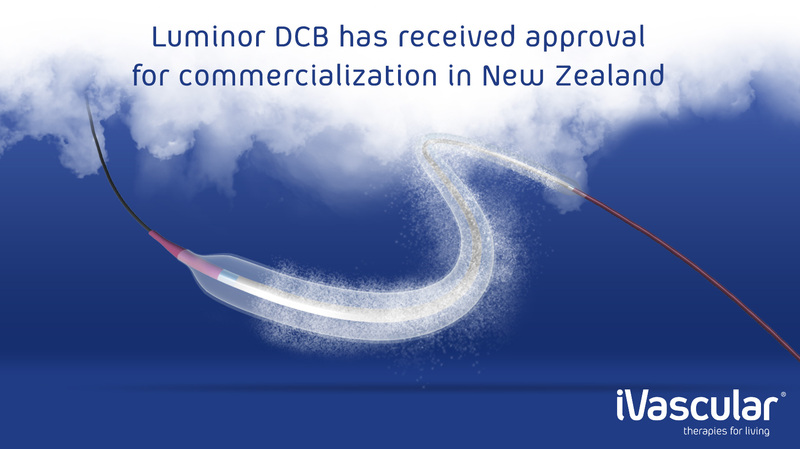 IVascular is pleased to announce that the Luminor Drug Coated Balloon (DCB) indicated for peripheral arteries, has received approval for commercialization in New Zealand. Luminor is a Paclitaxel Coated Balloon specifically designed for dilatation of stenosis located in the iliac, femoral, iliofemoral, popliteal, infrapopliteal and renal arteries, as well as for the treatment of obstructive lesions of arteriovenous fistulas, whether original or artificial. It is also indicated for stent postdilatation in the peripheral vascular system. Its extra low crossing profile combined with TransferTechTM, iVascular proprietary technology for drug release, have demonstrated Luminor DCB efficacy in several clinical studies. The EFFPAC Randomized Controlled Study (RCT) enrolled 171 patients at 11 German centers who were randomized to treatment with either the Luminor DCB or Plain Old Balloon Angioplasty (POBA). The comparison with other published RCTs, underlined that Luminor DCB demonstrates higher efficacy than most other available DCBs.